Saturday night I went to see Kacey Musgraves in concert at Rams Head Live. I had seen her last summer when she opened for Alison Krauss and Union Station and Willie Nelson at Merriweather Post Pavilion. I was excited to see her again as the headliner. Her album Same Trailer, Different Park is definitely my favorite country album from the past few years and one of my favorite overall albums as well. This was the first country act I’ve ever seen at Rams Head Live. In fact it’s the first country act I’ve ever seen at a venue like this that I can think of. I know a lot of indie rock bands who play venues of this size, but the only way I really ever hear country music is by listening to country radio so by the time I hear them they’ve hit it big and are already playing larger venues than ones like Rams Head or are opening for the larger acts at the bigger venues. Due to the types of bands I generally see play at Rams Head I usually feel like the old lady standing in a room with a bunch of 20 year olds. Last night’s crowd was quite different. It was an all ages show so there were people of all ages there. In addition to adults of all ages I saw a few families with elementary school aged kids and a number of parents with teenaged children. This is one thing I really love about country music. Aside from when we’re at the Newport Folk Festival I never see families at concerts the way I do for country acts. I was amused by the family standing behind me, parents with their teenage daughter. The dynamic was definitely your stereotypical snotty teenager and her parents that were purposefully feeding into it. I could tell that it was the teenager’s first standing room only concert as she was not dealing well with the way people shove and push around to get through the crowds and try to get a better spot at standing room only shows. Her parents were trying to teach her how to stand her ground. It was adorable. I’m sure she’d be horrified that I thought that. The show itself was great. I had never heard of the opening act John & Jacob before last night, but I really enjoyed their music and they were great performers. They had the crowd into it even though I’m betting most people there had never heard of them before either. They are great songwriters. One of their songs was apparently used on the show Nashville and they co-wrote The Band Perry’s hit song “Done”. Most of their songs were very upbeat, but this one that’s a little more balled-y was one of my favorite’s they played last night. 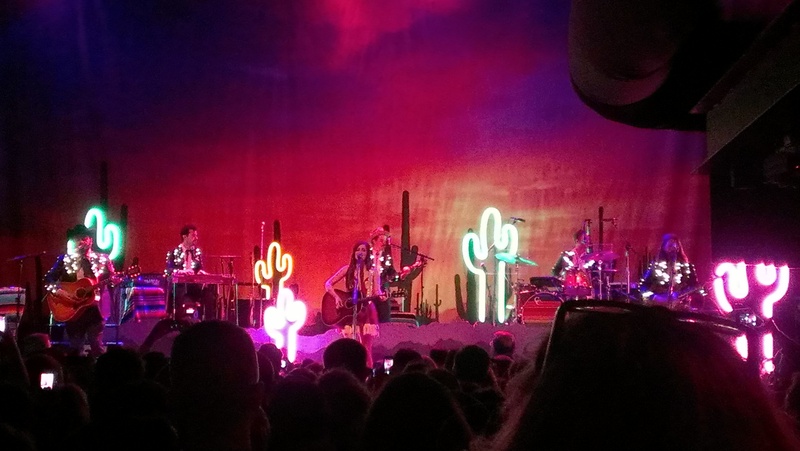 Kacey Musgraves was everything I hope for in a live performer. She told stories and she sang a few covers and mash-ups (a Dolly Parton song, a countrified version of Britney Spears’ “Toxic” and a mash-up of her song “Step Off” with Bob Marley’s “No Woman No Cry”). We also got to hear a few songs off of what will be her new album, which she sang solo on the stage without her band as part of the encore. The theme of both of them like her hit song “Follow Your Arrow” was about being yourself and not caring what anyone else thinks. She did say that it’s a theme she keeps coming back to in her music. One song was titled “Biscuits” and the other one was called “Cup of Tea”. I have no idea what the rest of the new album is, but if the entire thing is nothing but food titled songs with the theme of being yourself I can totally get behind that. Listening her to sing all the songs off of Same Trailer, Different Park reminded me once again about how great of an album it is. Not that I needed much reminding, but it was wonderful hearing the audience singing along with her. I still think I love “Merry Go Round” the most off of that album, and it was wonderful to hear her sing it live again with the crowd singing along. I suspect Kacey Musgraves has a long, successful career in country music ahead of her, and I’m excited to hear what she has for us next.